The Prospero’s have had some bad luck with broken items recently and they believe that it cant get any worse, can it? Pawel and Rosabelle spent much of their time yesterday repairing broken items around the house and that made them both very tired and they sleep in this morning, waking up with less than an hour to get ready for work. Of course the shower breaks when Rosabelle takes her morning shower. After a whirlwind prep for work in less than an hour both Rosabelle and Pawel leave for work. 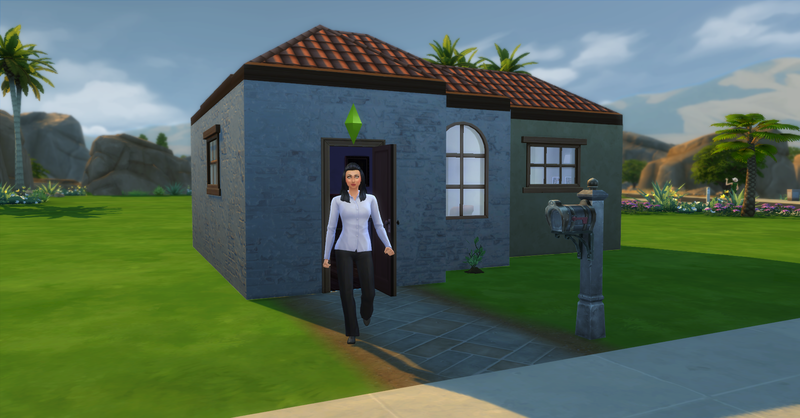 Today’s Report came while they were at work, funds are now §13,187 simoleons. 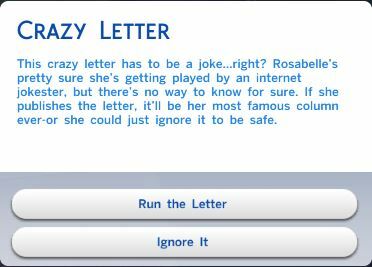 While Rosabelle is at work she receives a crazy letter and she has to choose whether to run the letter in the column or to ignore it. She chooses to ignore the crazy letter and not publish it. 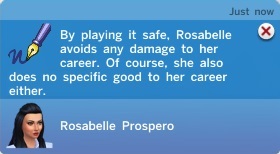 Ehh, Rosabelle figures better safe than sorry. Both Rosabelle and Pawel return home from work, it has been at stressful day at work for them and they have to come home to a house full of broken objects. The shower is still broken from this morning and the second computer has been broken for days. 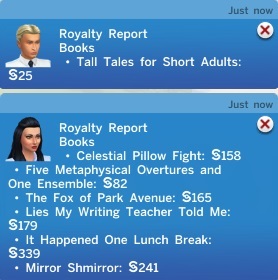 Rosabelle got promoted today to Regular Contributor, she received §352 simoleons in regular pay and a cash bonus of §703 simoleons. She was also awarded A Open Book wall hanging. 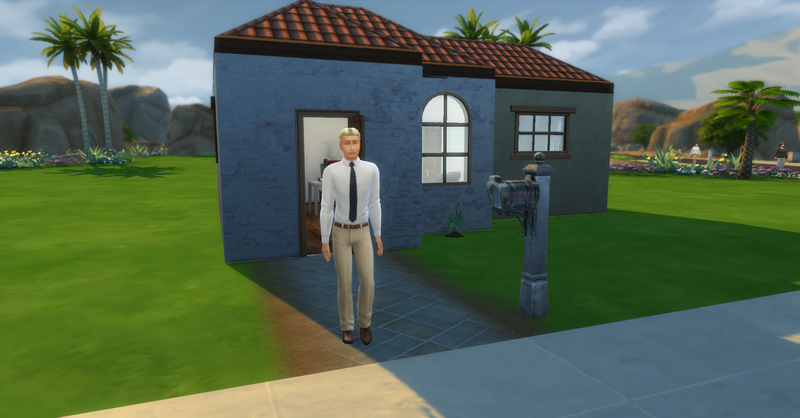 Pawel made §304 simoleons at work, their funds are now §14,546. They are both hungry when they get home so they eat left over scrambled eggs together. Pawel is stinky from not getting to shower this morning because it broke. He is also unhappy because of the messy environment since he is a neat sim. He sets about repairing the shower so he can use it. Meanwhile Rosabelle starts a Fantasy novel called “The Werewolf Journals”. Pawel gets 2 common upgrade parts from fixing the shower, he keeps them for later. After he is finished, he has to mop the floor or he will be upset for the rest of the night. It is getting late and Pawel has not started his work task of writing book so he resumes writing his non-fiction book, Supersim Me. Rosabelle tends the garden and goes to bed early because she has to work tomorrow. Pawel finishes his non-fiction book and rushed to send it to his NEW publisher. He has gained enough experince writing that he can actually have his books published by a company rather than self publishing them. Pawel is now extremely tired and heads inside to bed. He may be extremely tired but he is also extremely happy, he has found the love of his life and has a good job and a comfortable home. 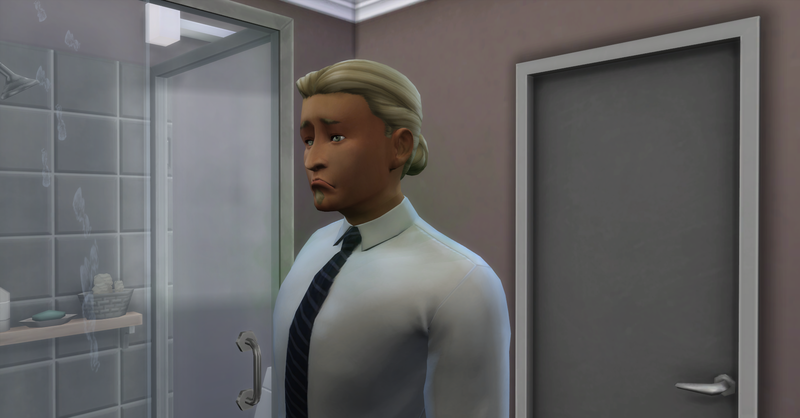 Pawel has been thinking recently that they are not getting any younger and if Rossabelle’s dream of having the family earn §1,000,000 simoleons is going to be achieved they are going to need to start a family soon. But he knows there is a very important step that needs to happen before the baby making can begin and tomorrow seems like just the day to to it.